Good place for works-in-progress and getting help if you need it! Note: I got the full version of Silo and went back to playing with the Fugazi1968 tutorials. Good stuff! A question to Jim or other more experience modelers: Poles (vertices where five edges meet) are not a death knell, are they? Any good words on them? I can't seem to get rid of two per arm pit when making box-modeled clothing. I also notice that the DAZ people meshes do have poles in spots--like on breasts and facial cheeks. They seem ok there. Your thoughts? It depends on how your modeler exports to OBJ. In MAX, it's no biggie, so long as all of the polys that connect to that vert follow the maximum limit of 4 sides per poly. If they don't, well, one of them is gonna get split at random. Other modelers may not be so kind. If you have 5 sides (or more) on a poly when you export, it will import into Poser, but the n-gons will be empty spaces - holes in the mesh, basically. 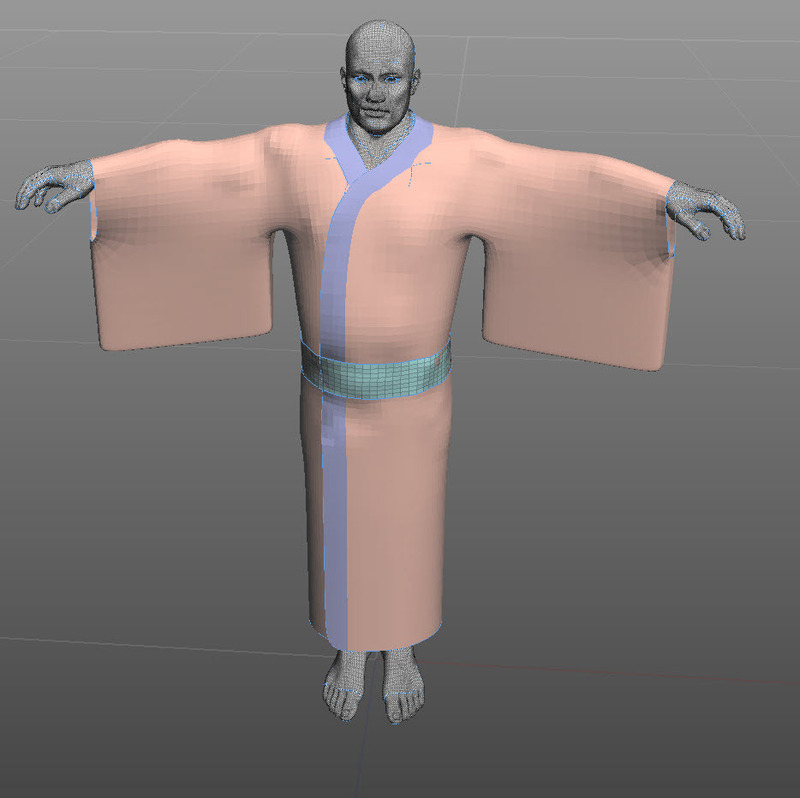 In a worst-case scenario, you will end up with a mesh in Poser that just looks like a crumpled piece of notebook paper, but this is rare in my experience. Check your export settings in Silo and see if there are settings to convert to quads (or tris, poser is cool with tris, too). If not, you may need to export from silo, then import into a modeler that has a configurable export, then try again. I'm probably OK, since the pole has quad polys all around it. Found an interesting tutorial about how to paint an eye (digitally, of course). Hm.. I have a few tuts I can share once I get home...WHEN I get home. Mark has plans for us to be out most the night getting stuff. I have SO much to do before helping him get ready for the holiday with his family and me shipping out to see mine. OOOh, hiya Dar. Didn't realise that was you. Yeah, don't come back as Typhoid Dar, that could lead to all sorts of problems. He likes to watch us run about wildly in confusion, which is why he changes his name about. Well, Typhoid D. could do that, too. *Screech! * Eh? *Slink, skulk, peer...Squint! * I wanna see! Is he hiding under the desk? In the closet? (Bwhahahahahaha...!) or...or... lemme guess? Is he chawin' on some poor schmuck's brainpan? XD! 'I finally got it AFTER I posted. I need to shine up that penny in the can, I think. Soon as someone pulls it outta m'ear. AHEM. We were Makin' Stuff and then got distracted. Ah, typical. 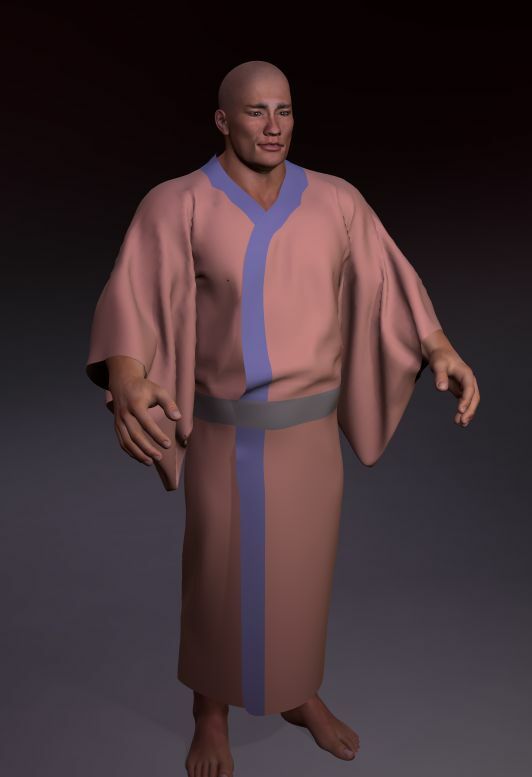 Here's a yukata I'm doing for one of LT's figments, in a screen clip from Silo. It's just got material zones in, it won't be that color (necessarily) in final. The only thing I see here that is a bit of an issue is that the sleeve should be completely open from top to bottom. It's not a small opening like that. I hope that doesn't cause issues! Will the neckline be able to sag open? Or is it welded like that? Hmm... you know what? I might be wrong about that. But the sleeve holes may be a bit on the small side as any of the ones I have looked at (including instructions on how to make them) have a pretty big sleeve hole. I guess that's why I always thought they were just open sleeves as a whole. Maybe just open them up a touch more? That'd do the trick. Thanks again for doing this. I'm very excited to finally have something that looks right on this character!!! From what I've seen she's got them about right. 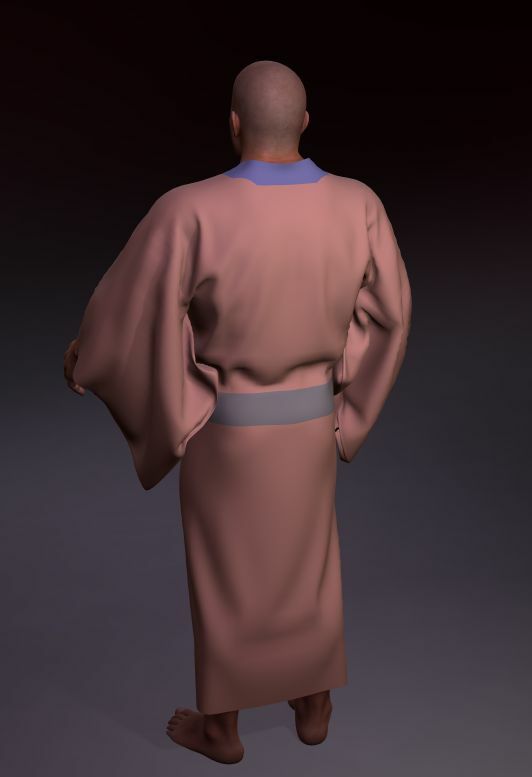 Those things functioned as pockets, as the only other thing worn with it (aside from shoes) was the fundoshi loincloth. Used as a dynamic, the opening will be longer, as it will drape. Well, they WERE proportioned so that the user could stick their arm in, so they have to be wide enough to permit two forearms to be through the hole at the same time. Probably could be a bigger opening, yes. I like how it's going so far! I can't model for crap, so I have a great admiration for those that can and make it look like it's supposed too! I've been working on that Antonia Male idea. I am having massive issues with the chest area for one. Though the face I've put together appeals to me for the most part. I still really don't like this model for the morphing. I've been working on the body for two days now in PP and Carrara trying to smooth, pull, tweak and force the mesh into something CLOSE to a male chest but I can't even bring myself to post them yet. Got the hips almost where I want, and have worked the waistline/ribs almost to where I want them. So- for now, I have two for the face to post for the Antonia Male look? "Anton" is an interesting face. Going to have to re-do a texture to get the eyebrows right, or paint 'em in post, but other than that--fascinating! Thank you! I actually used the texture set that came with the morph set. I don't have one finished for "him" yet. It's going to have to wait until I get back with the other pet projects. I know...was sort of annoying of me to even mention it (but you never know about intentions). Yes, texturing, in our copious and mythical free time. It was not annoying! *Cheekpinch* I want input. I think it was the VSS version of that skin texture..haven't they figured out how to use VSS without mucking eyebrows that can be transmapped INSTEAD of painted onto the texture? Meh. On a bright note: I came into the office to find a bottle of wine on my desk. Hee. I came home from the liquor store last week (making the hooch run) and as I was putting it away, I saw that I had somehow managed to squirrel away one each of El Milagro Silver (mostly done with), Reposado, and Anejo. 0_o Good heavens. I think I'll have Margaritas for Christmas. BB and his shaders...valuable work, but the man so annoys me and his renders are so crappy that I can't bring myself to use anything of his. Ugh. Well, not directly. *Snirk* I walked in and went. "Eh? o.O" I'll stash it away with my Walker in the cabinet. I just finished off the Maker's Mark, I'll save the Walker for when I'm truly hurtin'. A glass with three or four Alleve works wonders. Update on the yukata. (1) Haven't really re-made the sleeves, just cut the opening by two rows of polys (a little, in other words) and (2) did a dynamic test to see if I had about the right amount of geometry in the mesh--since you need a fair amount to get good draping. Here's two tests, front and back. Pay no attention to the color, again--except that the grey is about where the obi goes, so it's constrained (for my convenience, not the final). Wondering how I should do the Obi. Conformable that fits on top? Or a soft-decorated group? Soft decorated group. If you do it as a conformable that fits on top, you will have problems in the cloth room keeping the yakuta beneath it. What are the pro/cons? I wouldn't know offhand. Hee! So happy... At least one bright spot in my otherwise horrible day. That looks great Nano. Judging by the way the back drapes, do you know how to constrain vertices? Reason I'm asking is that I've got Noctem by Val (I think) and would love to have a dynamic version of the helmet, where the cloth strips can sway in the wind. (It was quite disappointing to see that there wasn't one included to start with , I can tell you.). I can get the cloth strips to become dynamic, but when I got them to that stage I could not get them to stay fastened so they always slid to the ground. I tried looking up tutorials for doing that stuff in poser but to no avail. also, for some bizarre reason poser turns each strip into two, presumably because it has two surfaces. Anyone with more knowledge than me got an idea? Constraining verts is done in the cloth room, selecting the verts and assigning them to the 'constrained' group. The Poser manual covers the basics of this. As for the strips coming into two, yes, it's likely because it has both a front and back. Ideally, you will want to delete the inside strip in your modeler before trying to turn it into a conformer. like I said, I have tried selecting the verbs but I must be thick as mince because despite my best efforts it simply would not let me select them in the cloth room so telling them to constrain themselves simply was not happening. I shall double check with the manual and give it another shot over the holidays. I'm guessing it is something blatantly obvious that I don't get. I loaded the helmet, then checked that I had the right cloth part selected using the material group and spawned a prop for that group. So far so good. Next I tried to select the vertices in question and nada. Poser would not even understand what it was ment to do. Verts can only be selected in the cloth room, using the various buttons which select which dynamic group you will be working with. You must have created a simulation, you must have selected the prop as the object to be clothified in that simulation, and you should select the character you wish the prop to collide with in the simulation (but you don't have to) before you begin working on vert groups. Once you have the vert groups selected, you can exit the cloth room and save the cloth to the library as a prop at any time. The selected vert groups will be saved with the prop for the next time you want to use it.